You have trained for months to run 26.2 miles and want to perform your best. Part of marathon training is learning to fuel properly. Use the weeks and days before your marathon to hone your diet as much as your stride, speed and gear to get the most out of race day. In the 12 to 24 weeks of training prior to your race, consume a diet of between 65 and 75 percent carbohydrates, advises Rick Morris, author of “Treadmill Training for Runners.” Quality carbohydrates found in whole grains, fruits, vegetables and low-fat dairy provide you with a constant stream of energy. Avoid quick, refined carbohydrates such as white bread, soda and sweets as these provide quick spikes in blood sugar and may cause weight gain. Sports drinks and gels consumed during long training runs are the exception to this rule. During most of the tapering phase of training, when you are cutting back on mileage, you should maintain your diet consisting of about 70 percent carbohydrates. Keep track of calories during these weeks as you are exercising less and burning fewer calories. Eating the same amount that supported 50 miles or more per week of running may cause weight gain. A dieting method called carbohydrate depletion falls in and out of favor with marathon athletes. The theory is that you deprive your muscles of carbohydrates for a few days in the week before your race and then load back up in the immediate days before the event. Carb depletion followed by loading supposedly maximizes your glycogen stores, the muscles’ main source of energy. For example, if your race is on Sunday, the Monday prior you would consume 60 percent of calories from carbs, the Tuesday prior consume 50 percent of calories from carbs, the Wednesday prior 40 percent of calories from carbs and then on Thursday through race day resume consuming 70 percent of your diet in the form of carbohydrates. Traditional carb loading also involves extremely intense spurts of exercise on the low carb days to fully deplete your glycogen stores. A training protocol that condenses a week’s worth of carb depletion and loading into one day has also been touted to improve athletic performance, as per an Australian study published in the journal “Medicine and Science in Sports and Exercise” in June 2002. Researchers had seven athletes cycle at all-out intensity for 2.5 minutes and then ingest a large amount of carbohydrates for the next 24 hours. The next day, the athletes experienced as great of glycogen store gains as those who performed a carbohydrate loading program for two to six days. Another study, published in the “European Journal of Applied Physiology” in March 2002 found that the carbohydrate depletion phase was unnecessary and that simply loading on carbohydrates in the 24 hours before a race resulted in increased glycogen stores and improved performance. 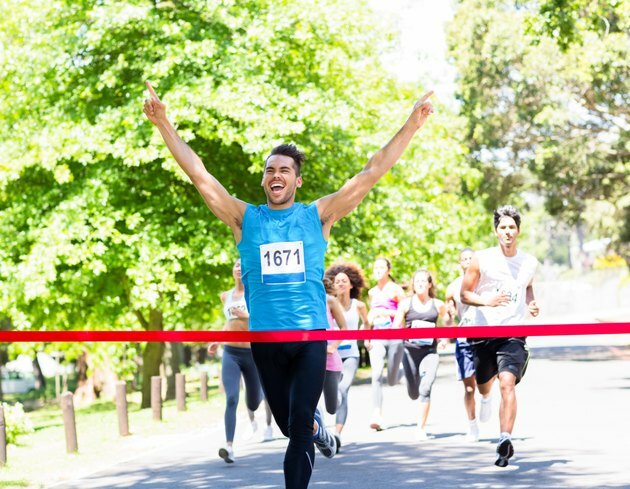 Regardless of which dieting method you choose to follow, remember that experimenting with new foods and dieting methods in the days before the race may backfire and cause digestive distress or fatigue. Whether or not you carb deplete, most experts, including noted running coach and marathoner Hal Higdon, suggest eating a diet high in carbohydrates the day before the race. Pasta meals, pancakes or extra rolls at dinner can help top off your glycogen stores and help you race the following day. The day before a race is not the time to worry about your weight or the calorie implications of high carbohydrate foods. Fueling the morning of your marathon is critical to performance. Choose an easily digested meal that provides calories and energy. High fat, high protein breakfasts may digest too slowly and make you feel sluggish during the race. A breakfast such as a whole wheat bagel with a small amount of butter or peanut butter offers carbohydrates with just enough fat to slow the release of the sugars into your bloodstream. Eating a very quick digesting food, such as a sports bar, may give you immediate energy for the beginning of the race, but may leave you feeling weak at the end.